Catnip (Nepeta cataria) is a perennial herbaceous shrub in the mint family that’s sometimes known as the cat’s best friend. Anyone who’s seen a cat batting around toy mouse or ball stuffed with catnip knows that many cats simply love this herb, and will eat or even roll around in it whenever they get the chance. 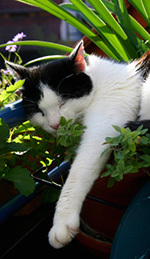 Catnip has a reputation for making cats playful and silly, but what many people don’t know is that catnip isn’t just for cats: catnip herb and catnip essential oil have also been staples in European herbalism and are still used in alternative medicine today. Sometimes called catmint or catswort, the catnip plant has oval or triangular leaves and small but showy pale purple or white flowers. 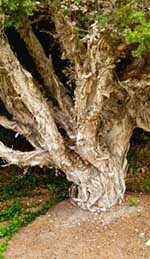 It is native to all of Europe and parts of southwest and central Asia as far east as India. Before trade with China introduced the rest of the world to black tea, a tea made from catnip leaves was a favorite in England, where it was consumed as a refreshing summertime beverage as well as a medicinal tonic for digestive cramps and spasms . Catnip tea is also high in vitamin C and may have a mild sedating effect similar to chamomile tea ; a cup of catnip tea can be just the thing to soothe the mind before bedtime. Medicinally, catnip essential oil is used in aromatherapy as a mild analgesic and anti-inflammatory , reflecting the traditional use of catnip leaf as a poultice for minor wounds and inflamed or irritated skin. Catnip essential oil is also sometimes used in formulations for toning the skin , and some herbal vendors sell a tincture form of the dried herb for treating upset stomachs and flatulence . More recently, some studies have indicated that catnip oil may be an overlooked insect repellent: studies performed on nepetalactone, one of the main compounds in catnip oil, have shown that it is more repellent to mosquitoes and cockroaches than the chemical repellent DEET . Though generally considered safe and nontoxic, catnip essential oil may irritate sensitive skin and is best used in a blend with other essential oils. Here’s a sample recipe for a fragrant and effective insect repellent blend: combine 3 to 5 drops of catnip oil with 3 to 5 drops of cedarwood, citronella, and lemongrass oil. Diffuse outdoors in a burner or diffuser to repel biting insects while scenting your patio or porch with uplifting lemongrass and earthy cedarwood. 2. Sheppard-Hanger, Sylla. 1994. The Aromatherapy Practitioner Reference Manual. Tampa, FL: Atlantic Institute of Aromatherapy: 309. 4. Schultz, Gretchen, Chris Peterson, and Joel Coats. 2006. “Natural Insect Repellents: Activity Against Mosquitoes and Cockroaches” in A.M. Rimando and S. O. Duke [eds. ], Natural Products for Pest Management. ACS Symposium Series #927. Washington, D.C.: American Chemical Society. This entry was posted in Clinical Aromatherapy, Essential Oils on October 8, 2013 by Keith Cleversley. The flowering plant commonly known as chamomile has a rich and varied history in European herbalism. 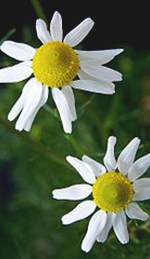 For one thing, there are actually two distinct species that share the common name chamomile. In this article we’ll be discussing German chamomile (Matricaria chamomilla), an upright flowering annual native to Europe and temperate Asia. Its cousin, Roman chamomile has many of the same properties but a slightly different composition of compounds in the essential oil. For instance, German chamomile essential oil is valued for its high concentration of chamazulene, an anti-inflammatory compound that gives German chamomile oil its dark blue color . The ancient Greeks coined the word chamomile from two different Greek words, kamai meaning “earth” and mélon meaning apple; so chamomile can be literally translated as something like “earth-apple”, a reference to its similar fragrance and flavor . And like the saying, “an apple a day keeps the doctor away”, they believed that chamomile also had many medicinal applications: it was even listed in Dioscorides’ Materia Medica, the first compendium of Western herbal medicine ever compiled. The rich blue color of German chamomile oil comes from chamazulene, which is not present in the fresh flowers but is produced during steam distillation. German chamomile oil is sometimes called blue chamomile for this reason. Chamazulene gives German chamomile oil renowned anti-inflammatory and anti-irritant properties, so the oil is frequently used in blends to treat inflamed or irritated skin, itchy skin, and dermatitis . Because of its ability to tamp down allergic skin reactions, German chamomile oil can also be used as a natural antihistamine . One study measured the anti-allergic effect of a compress of German chamomile flowers and found it to be as effective as a 1% hydrocorticosteroid cream on certain types of skin lesions . Like the closely related Roman chamomile, German chamomile oil may be a mild relaxant and nervine, and is commonly inhaled to relieve states of nervousness and encourage sleep . Aromatherapists also use German chamomile oil to cleanse the liver, as a mild laxative, and as a sinus decongestant . A hot tea made from either species of chamomile flowers can also clear nasal congestion within 10-30 minutes after consumption . Although originally native to Europe and temperate Asia, German chamomile has also been naturalized to North America and Australia, where it sometimes grows in cultivated fields as a weed. German chamomile seeds require open soil to germinate and survive, so the plant tends to stick close to areas of human settlement such as roadsides, farm fields, and even landfills. With so many therapeutic benefits, this hardy, adaptable plant is sure to be sought out for generations to come! 1. Safayhi, H, J Sabieraj, ER Sailer, and HP Ammon. 1994. “Chamazulene: an antioxidant-type inhibitor of leukotriene-B formation”. Planta Medica 60 (5): 410-13. 2. 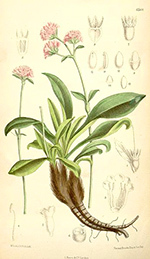 “Matricaria chamomilla | Etymology”. Wikipedia. Last modified January 26th, 2014. http://en.wikipedia.org/wiki/Matricaria_chamomilla#Etymology. 3. “German Chamomile”. University of Maryland Medical Center. Last modified March 17th, 2013. http://umm.edu/health/medical/altmed/herb/german-chamomile. 4. Chandrasekhar VM, KS Halagali, RB Nidavani, MH Shalavadi, BS Biradar, D Biswas, IS Muchchandi. 2011. Anti-allergic activity of German chamomile (Matricaria recticuta L.) in mast cell-mediated allergy model”. Journal of Ethnopharmacology 137 (1): 336-340. 5. Charousaei F, A Dabirian, F Mojab. 2011. “Using chamomile solution or a 1% topical hydrocortisone ointment in the management of peristomal skin lesions in colostomy patients: results of a controlled clinical study”. Ostomy Wound Management 57 (5): 28-36. 6. Graef, Nyomi. “Does chamomile work for anxiety, sleep problems and relaxation?” Extra Happiness. Last modified September 16th, 2010. http://extrahappiness.com/happiness/?p=3775. 7. “How to Release Sinus Pressure: 8 Steps”. WikiHow. Accessed June 30th, 2014. http://www.wikihow.com/Release-Sinus-Pressure. This entry was posted in Aromatherapy, Clinical Aromatherapy, Essential Oils and tagged calming essential oil on May 8, 2013 by Keith Cleversley. Cassia (Cinnamomum cassia) is often used interchangeably with cinnamon as a spice, flavoring and fragrance, and it has many of the same therapeutic properties as cinnamon essential oil. Many people confuse these two spices due to the common practice of labeling ground cassia as cinnamon in grocery stores. However, when choosing between cassia essential oil and cinnamon oil, it’s important to know the species you’re getting because these two related plants have different strengths in aromatherapy. The cassia tree is a small evergreen native to China and Burma, and cultivated alongside cinnamon (Cinnamonum zeylanicum) in the east and southeast Asian countries of Taiwan, Indonesia, Malaysia and Sri Lanka. Cassia trees have shiny, almond-shaped leaves and thick, reddish brown bark that is ground to make a spice similar in flavor to cinnamon . 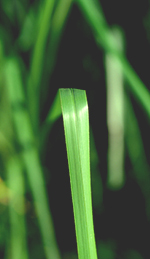 The bark is also the part of the plant that is steam distilled to produce cassia essential oil. Cassia often gets little mention in the history of the spice trade, even though it was and continues to be a major competitor of cinnamon. Old Testament scholars have speculated that cassia oil may have been one of the ingredients in the holy anointing oil given to Moses, along with frankincense, myrrh, and of course, true cinnamon . Some scholars have also suggested that the Hebrew word for cassia means “like cinnamon”. In ancient times, cassia probably made it to the Middle East through trade with India. Because cassia is more cost effective to mass produce than cinnamon, it’s used frequently in commercial flavoring for everything from candy to baked goods to savory curries. Cassia oil is also added to mouthwashes as an antiseptic; this property also makes cassia essential oil an affordable choice for aromatherapy treatments targeting infections . In addition to its antiseptic action, cassia oil is wonderfully warming and stimulating: metabolism and digestion both get a boost when cassia oil is inhaled . One reason cassia is so popular as a spice is because it works as an aperitif, increasing appetite and decreasing nausea brought on by certain conditions. Preliminary research is even being done on cassia’s potential for lowering blood sugar in type 2 diabetes . Like its cousin cinnamon oil, cassia oil is considered to be a potential dermal irritant and sensitizer due to its methyl eugenol content, and should not be used topically. Aromatherapists recommend diffusing cassia essential oil from a burner or diffuser . Although both spices have their merits, we know culinary enthusiasts will want to know how to distinguish true Ceylon cinnamon from cassia. 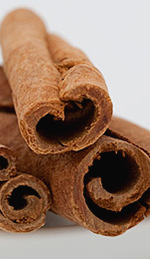 The one sure way is to look for whole cinnamon sticks: true cinnamon sticks are made up of fragile, papery layers that break off easily and can be quickly powdered in a coffee or spice grinder. 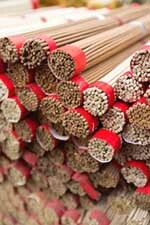 In contrast, sticks of cassia bark come in one thick, rigid layer without the “parchment” quality of true cinnamon. 1. “Cinnamomum cassia“. Wikipedia. Last modified May 26th, 2014. http://en.wikipedia.org/wiki/Cinnamomum_cassia. 2. Cinnamon and Cassia: The Genus Cinnamomum. 2003. P.N. Ravindran, K. Nirmal Babu, and M. Shylaja, eds. CRC Press: pg. 4. 3. Ryman, Danièle. “Cinnamon/Cassia Essential Oil”. Aromatherapy Bible. 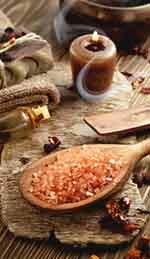 Accessed July 1st, 2014. http://www.aromatherapybible.com/cinnamon-cassia.html. 4. Davis, PA and W Yokohama. September 2011. “Cinnamon intake lowers fasting blood glucose: meta-analysis”. Journal of Medicinal Food 14 (9): 884-89. 5. Tisserand, Robert and Rodney Young. 1995. Essential Oil Safety. United Kingdom: Churchill Livingstone: 204. This entry was posted in Clinical Aromatherapy, Essential Oils on May 7, 2013 by Keith Cleversley. A ceremonial incense of divinity, the tree resin Boswellia serrata (frankincense) and its essential oil derivative have historically been used to ward off evil spirits and connect humans to divine spirits and realms. It is primarily a popular incense and perfume, but is also used in cosmetics and skin treatments with some indication that it may fight cancerous cells – although this is a claim that has yet to be affirmatively and scientifically proven. 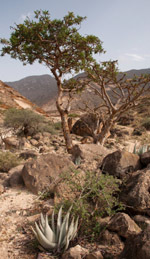 Background: Another name for frankincense is olibanum and this refers to the aromatic resin that is retrieved from trees of the genus Boswellia. Frankincense essential oil is derived from the Boswellia resin. There are only four species that are known to produce what can be considered real frankincense resin, and the resin is produced by these trees in varying quality levels. Adding to the romanticism of frankincense is the origin of its name, having evolved from the Old French “frank encens” – which is directly translated as “high quality incense” . Frankincense is famously well-known, especially if you’ve grown up in a Christian, Christmas-celebrating household: in the bible frankincense is reported to have been carried to baby Jesus by the three wise men as a gift in honor of his birth . In fact, frankincense has also historically been one of the most popular essential oils – having been used religiously or spiritually in ceremonies and celebrations throughout many ancient cultures. Additionally, frankincense is an incense consistently found throughout historical religious and meditational practices of the Western world. Just about every ancient western culture is known to have used frankincense ceremonially – particularly throughout Sumeria, Babylon, Egypt, Assyria, Greece and Rome . It is believed to have come to these major social or cultural centers through trade with the Arabs, Somalis and Bedouins – who purportedly obtained the resin from small desert trees in Saudi Arabia and Somalia and had been doing so for thousands upon thousands of years . Use: Traditionally, frankincense is probably most widely used as an incense – in fact the word was essentially synonymous with incense throughout Western cultures. “It was the scent of purification”, burned to ward off evil and to open oneself to divine presences – enabling a connection with higher spirits and a level of contemplation necessary for these divine connections; frankincense represented a divine connection between heaven and earth . This spiritual affiliation of frankincense with the world of divinity overlapped with its use as a perfume and its use in skin care regimens. The ancients as well as people today have used frankincense widely within their hygiene practices, and in some cultures this is correlated with its use to ward off illness and bad energy. As a kind of aesthetic extension of its spiritually related purpose, the resin was also combined with kohl and used as black eyeliner to ward off “the evil eye” and was even used in a special concoction that removed unwanted hair ! It has also been used in Asian, African and Ayurvedic traditional medicine to treat several digestive and skin-related health conditions as well as arthritis, wounds, female hormonal balance and air purification . Blending: Frankincense is a component of “kyphi” – a house incense within the temples of Heliopolis, burnt every sunset to honor the evening departure of the sun god. 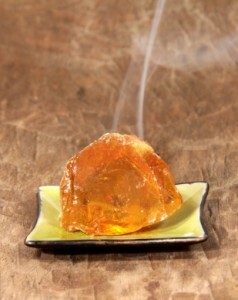 Frankincense can also be found along with about 16 other ingredients in sacred incense recipes of the Talmud. 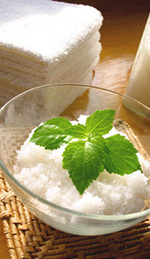 One particular biblical recipe includes stacte (might be myrrh), onycha (musk), galbanum and frankincense . Safety: While the resin of frankincense is reported to be edible  it is extremely important to consult with a physician before ever ingesting essential oils in any form. Essential oils can be incredibly potent – and even if they yield benefits in small doses, too much can often be harmful and some aren’t supposed to be ingested at all. If they are ingested it is often under the direct recommendation or oversight of a health practitioner that is specialized in the use of natural health remedies. 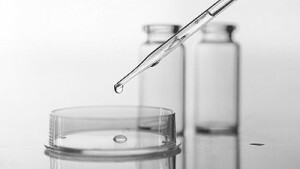 Additionally, although there are several studies linking Boswellia resin and essential oil to the termination of cancer cells, it has not yet been proven conclusively and it would be best to discuss such a topic with a health practitioner. The online resource Pubmed perhaps says it best: “limited conclusions can be drawn from the preliminary findings of this laboratory study as it is yet to be published in a peer-reviewed journal. And some of the claims should not be taken at face value; in particular the press release’s claim that frankincense has no known side effects. Such claims would need rigorous scientific evaluation before they could be verified .” However, it is worth noting that frankincense has since been discussed in peer-reviewed journals and other scientific platforms that were discussed briefly above. All considered though, frankincense is clearly one of the most romantic and sensually elegant of the essential oils; with its divine history, frankincense essential oil is truly fit for the gods and the beautiful human spirits amongst us! 1. Asian News International. “Frankincense could harbor breast cancer cure”. Al Bawaba (Middle East) Ltd. New Delhi, Nov 7, 2013. 2. Holmes, Peter. “Frankincense Oil: The Rainbow Bridge”. International Journal of Aromatherapy, Vol. 9 (4), January 1998: p. 156-161. 4. Ni, Xiao; Suhail, Mahmoud M; Yang, Qing, et al.“Frankincense essential oil prepared from hydrodistillation of Boswellia sacra gum resins induces human pancreatic cancer cell death in cultures and in a xenograft murine model”. BMC Complimentary and Alternative Medicine, Vol. 12 (1), 2012: p. 253. This entry was posted in Clinical Aromatherapy on March 27, 2010 by Keith Cleversley.